Why Do I Consider This Book Odd: Because this book documents one of the most unique cemeteries in Europe and because if I enter the city name as it is spelled with correct diacritical marks, WordPress will automatically put every letter with a diacritical mark in the name in bold and italics throughout the entire entry for those reading on mobile devices. 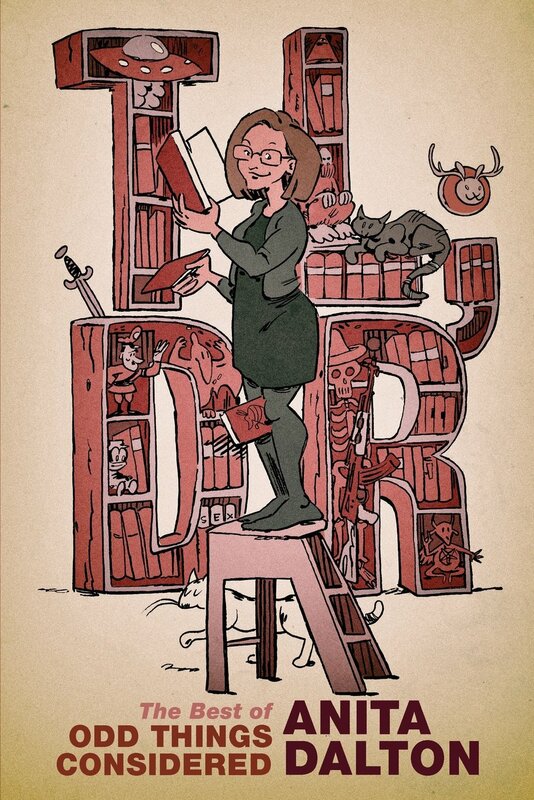 Comments: This is a delightful little book. I bought it on a whim at the now closed Domy bookstore in Austin, but the photographs and general nature of the cemetery affected me deeply. I feel strongly that if I am to be buried after death, I want a marker like those in the Merry Cemetery to mark my resting place. I rather hope I am cremated, or maybe Mr OTC could work up the nerve to haul my carcass out and do a sky burial, but if one is to be covered in dirt for eternity, this is a nice way to do it. Merry Cemetery is in Sapanta, Romania. Sapanta is in northern Romania, in a part of the country called Maramures. According to Golopentia’s essay, around 3500 people live in Sapanta, and the cemetery is now a large tourist destination. The cemetery’s colorful and at times jovial approach to death can be attributed to Ion Stan Patras (spelled differently throughout the internet but this is how the author’s essay in this book spells and orders his name), who began carving crosses as grave markers in 1935. Patras was an artist who initially carved lovely gates for his townsfolk, and began to carve the crosses for the cemetery. He wanted to take a livelier approach to death, incorporating bright colors into his designs. 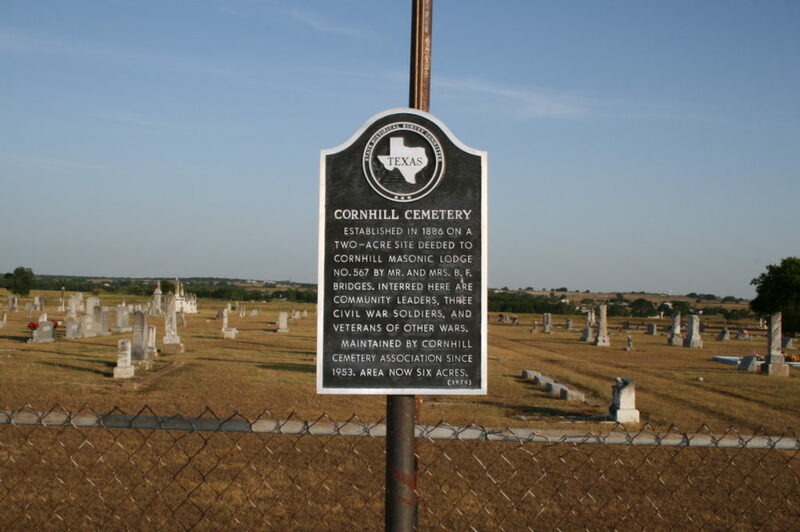 The plots are separated with concrete dividers that are not that common in the USA but interestingly can be found in some cemeteries near where I live in Texas, where Eastern European immigrants settled. These crosses for the cemetery plots almost visually seem like doors to me, an interesting correlation given Patras’ early career as a gate-carver. Patras’ desire to create long-lasting and memorable crosses led him to begin to carve portraits of the dead into the wooden crosses. Golopentia’s essay speculates that pre-World War Two rural Romanians often could not afford the glass coverings or porcelain transfers that would create long-lasting photos on headstones, so Patras took it upon himself to carve or paint long-lasting portraits of the deceased. Patras’s colorful and lovely carved crosses became sought after by those who liked the bright and personalized approach to death that Patras created. Before long, the colorful crosses with portraits had phrases meaningful to the deceased painted on them. Sometimes those portraits depict how the person died and can be unnerving at first. There can be no patronizing “this is the death he or she would have wanted” when you can see the child being hit by a car or the soldier being shot to death. You can’t tell yourself the dead lived a wonderful life when the epitaph they influenced is telling you their life was too short and that they hope their killer burns in hell. Those epitaphs eventually developed into one of the most striking features of the Merry Cemetery. Painted in first person from the perspective of the dead, poems and short essays are painted on the crosses speaking directly to family members or those who pass by the cross. 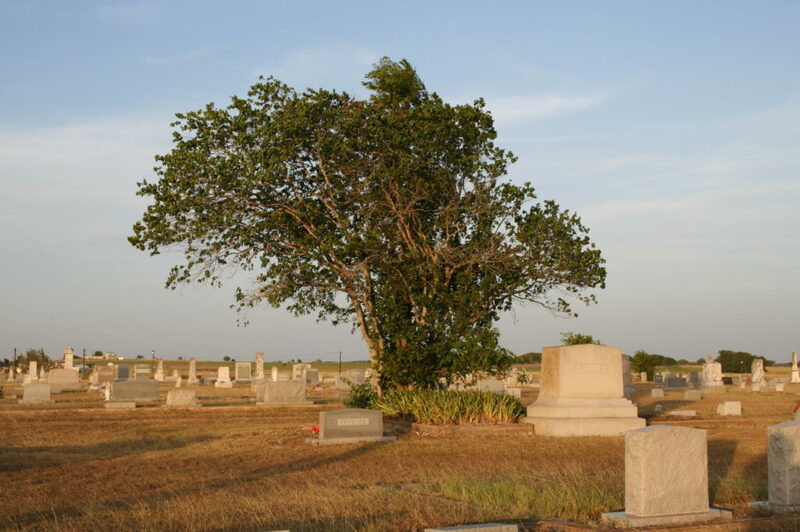 The cemetery speaks directly to the living, forcing family and tourists alike to acknowledge the dead as they speak to us from their final resting place. The Merry Cemetery shows a very different approach to death – remembering the dead is a colorful, mostly visually pleasant experience there, and the dead get to speak to us outside of the usual Christian sentiments and iconography that are used on headstones all over the Western world. It is that unusual approach to death that makes this cemetery so sought after to photograph. Romania has influenced much that is dark and frightening in horror culture, from Dracula and vampires in general to the utterly grim and heartbreaking effects of communist totalitarianism on the weakest citizens. 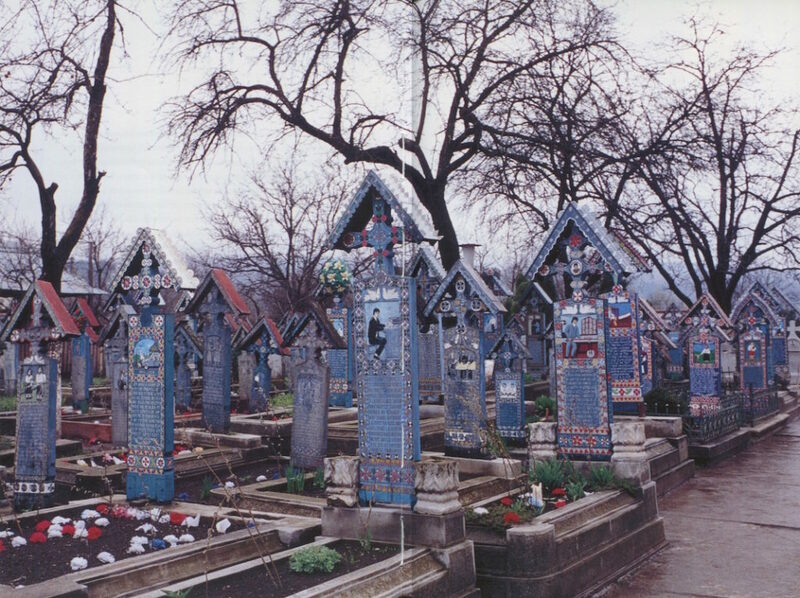 We don’t expect to find a cemetery like the Merry Cemetery in Romania – hell, we don’t expect to find such a place in much of Europe, where somber cemeteries with solemn statuary and orderly tombs express the very Protestant notion that there can be no happiness or humor in death, or that a sad sentiment cannot be expressed with vibrant folk art. And interestingly, we tend not to associate anger with cemeteries, all those European angels wielding swords aside, but some of the epitaphs on the crosses in the Merry Cemetery are harsh and angry. There a beauty in this sort of naked honesty in death. Gorgeous colors, intricate carvings, accurate portraits, personalized requiems that aren’t holy or full of saccharine sentiment. This is the sort of death that defies the living applying the platitudes that serve us and not them. 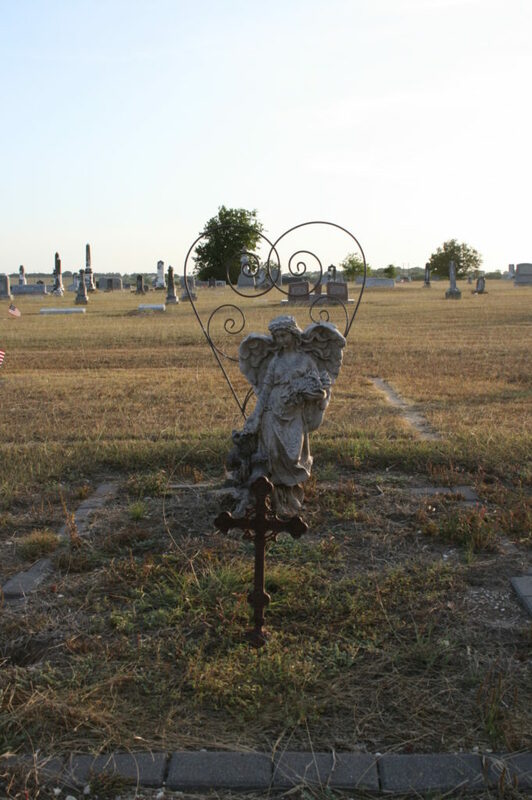 I have a few favorite crosses/headstones in the Merry Cemetery, and I encourage you to seek out other photographs and translations of the Merry Cemetery crosses (assuming you aren’t Romanian). This book is lovely and has some excellent representations of the crosses in Merry Cemetery, but it’s by no means comprehensive.